Clicks any of the above images of Fort Jay, formerly Fort Columbus, for larger B&W images on Library of Congress American Memory site. 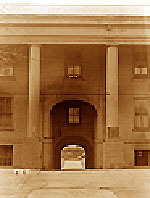 Of late years there have been an unusual number of escapes from the old prison, which have been planned and carried out in the face of tremendous odds. . . .Castle Williams itself is an imposing structure . . . It is circular in shape, with a large garden in the center, above which is flanked two rows of cells. The garden is covered with closely cut grass and decorated with pyramids of cannon balls. . . . The ground floor of the castle is used entirely for offices of the prison sergeant, the dining room, the carpenter shop, laundry, bake shop and kitchen. . . . The cells throughout are heated by steam and lighted by electricity. The baths are in excellent condition, and the prison fare, which is always wholesome, is made a special feature at holiday festivities. The menu for each meal is posted on the dining room wall and the following is a sample of the every day fare. "Menu: Breakfast -- Fried bacon, fried potatoes, bread and coffee. "Dinner -- roast young pork, brown gravy, mashed potatoes, mashed turnips, rice pudding, with milk and eggs. "Supper -- Baked pork and beans, pickles, bread and coffee."
. . . prisoners eat in first and second calls to mess. The kitchen is a continuation of these rooms and the bake shop opens off the kitchen. When a prisoner enters Castle Williams, he is asked what trade or occupation he pursued prior to entering the army and he is then put to work in a position in which he can do the most good with his time to serve. The overseer, Sergeant Lorenzo Bell, lives in the prison and his office work is creditably transacted, bookkeeping and clerical work being done with the accuracy and despatch that obtain in large legal concerns anywhere, and all this efficiency is the work of the prisoners. There are carpenters who are at present turning out furniture which is used only by officers at the military post; there are shoemakers who are skilled in their trade; tailors who are put to work on the prison clothing; and each one at his trade as in some big industrial school. For the most part, the men are set to work about the grounds of the reservation and some of the boys are at work in the officers' homes, . . . There are 235 at the prison at the present time and the great common cause of their desertion is drink. Whenever the prisoners show rebellion to the order of discipline they are put to work on the rock pile and a few of the obstreperous ones are confined to the solitary cells or dungeons on the top terrace, which are reached by a winding stair, in the tower. The general cells are all built large enough to furnish twelve beds and are perfect in ventilation and sanitation. Each cell opens upon the inner garden, in true Spanish fashion. Each prisoner is furnished with a roughly made cupboard for books and clothes and the little keepsakes from home, and are all well decorated with photographs. Castle Williams is now the proud possessor of a military prison band that practices regularly every evening and frequently gives concerts on the grounds. On Sunday the prisoners in a body attend the services at the Episcopal Church at 3 P.M., and enter into the song services with keen enjoyment. They are not compelled to attend church but do so voluntarily, and the close communion which exists between Chaplain [Edmund Banks] Smith and the prisoners has helped to make many a hard place smooth. There are stories of hardships, severe discipline and suffering that only a sympathetic servant of God can relieve, and thus many of these soldiers who have served with military distinction are reconciled to the life made melancholy by what might have been. When the prisoner has served his time, allowing a deduction for good behavior, he is given a new suit of clothes and $5 when he leaves Castle Williams. 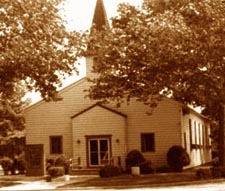 When the above newspaper article mentioned prisoners attending Sunday afternoon services at the Episcopal Church in the summer of 1907, it was referring to what then was the “new” Episcopal Chapel of St. Cornelius the Centurion. 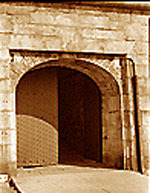 The granite structure that replaced its wooden predecessor had been dedicated only eight months earlier. 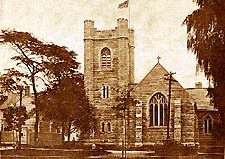 As had been the case with the original chapel built in the 1840s, the 1906 construction of the replacement came about with the help and support of Trinity Church. In 1844 when the Rev. Dr. John McVickar was appointed the island’s chaplain, he found that what religious services took place there were conducted open air or in temporary shelter if forced by weather conditions. 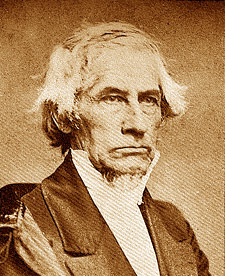 McVickar, who served as chaplain until 1862 when he retired at age 75, was a scholar by nature but also proved himself a man of action when need for that arose. A professor of moral philosophy, literature, and political economy at Columbia College and author of several serious tomes, Chaplain McVickar enlisted support for the island chapel project from Trinity Church and its wealthy and powerful members. Major Gen. Winfield Scott, chief of the Army, made 150 square feet on the south side of the pre-landfill island available for leasing as a church site. The wooden structure was dedicated April 19, 1847. Nearly six decades later – Oct. 17, 1906 – the present granite, 14th Century English Gothic building, designed by architect Charles C. Haight, a Civil War veteran, was dedicated. Its site is not far from the wooden original’s site. 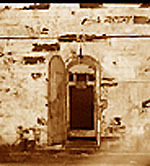 The chapel’s electronic chimes were installed in 1949 as a gift of the garrison. “. . . the best part of being an Episcopal Chaplain on duty with the Coast Guard was the opportunity to be a part of the Trinity Parish staff. Our Lady Star of the Sea Catholic Chapel built in 1942. 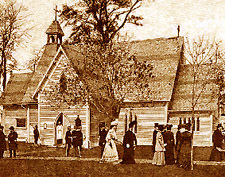 When the Army operated Governor’s Island as Fort Jay, a Revolutionary fortification of New York harbor, and long before there were military chaplains there, Trinity Parish had taken upon itself the ministry to the religious needs of the island’s Army residents. Before the advent of ferry boat service, every Sunday a priest would row the quarter mile from the Battery to the Island, struggling with the heavy cross currents of the East and Hudson Rivers. After two wooden chapels burned down, Trinity built a beautiful stone chapel, which they also supported with clergy, maintenance, and program funds. The Army finally brought in its own Chaplains, but the other support continued until the Coast Guard finally left the island. . . . Episcopal chaplains assigned there were considered ex-officio members of Trinity Parish. As such, I was privileged to preach in that historic church during a Lenten season and to participate in their liturgical and social functions. . . .
Trinity is arguably the most historic parish or church in the United States, having received a land grant from Queen Ann long before the Revolution. It is located on Broadway at Wall Street and includes an historic grave yard which seems delightfully out of place in that busy center of the financial district. Aaron Burr and Captain Cook are interred there. . . . The New York Stock Exchange is just one block down Wall Street, and the American Stock Exchange is located in a building owned by Trinity and just behind the church. . . . For years Trinity had at least nine parochial missions, which made it almost a diocese unto itself. . . . While it still retains a relationship with those other parishes, most are now independent, except for St. Paul’s, located just two blocks north on Broadway. . . .St. Paul’s was the focal point in providing aid and solace to the workers at the demolished World Trade Center. Prior to 1883 Roman Catholic masses and other liturgical services had been held under the auspices of Saint Peter's Church in Barclay Street. 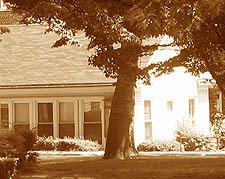 Since then, the Island's parish has been affiliated with the Mission of Our Lady of the Rosary on State Street. The Catholic Chapel, Our Lady, Star of the Sea, was built in 1942. It is marks the location of the old Post Cemetery. In 1886 the remains of those whose bodies were interred in the cemetery were removed to the Cypress Hills Cemetery in Brooklyn. During World War II, Rabbi Sidney M. Bogner served as a chaplain at Fort Jay. Later he performed chaplaincy duties with police. fire, and air patrol agencies as well as hospitals. He taught at Essex County College. Only after WWII, did those holding Jewish services on the island have a house of worship to call their own for conducting them. It is said to be the smallest of the religious structures on the island in terms of size. But in matters of faith, service and worship, it is also said that size is not the measure. Page 1 -- The page includes an opening overview and sections entitled "van Twiller, John Jay & Jonathan Williams" and the "School of Practice for Field Musicians." Page 2 -- Includes "The Execution of John Yates Beall, C.S.N." and "Saboteur's Gallows Song in Governors Island Drum Major's Music Book." Page 3 -- Includes "Chaplain to POWs at Governors Island and Andersonville " and "Governors Island Prisoners Included Chiricahua Apaches." Page 4 -- This current page includes above "Castle Williams Prison Life 1st Decade of 20th Century" and "Chapels on Governors Island." Page 5 -- Includes "East Coast 'Alcatraz' " and "1966, a West Point chapel, 'Taps' & [late 1930s NYC Correction Commissioner] 'Michael Stone' ." Page 6 -- Includes Non-Commercial Use Permission, Bibliography, and Source Credits. © NYCHS reserves and retains all rights to the text other than quoted excerpts. Non-commercial educational use permitted provided NYCHS and/or its web site -- www.correctionhistory.org -- credited as the source. Associate Professor Jannelle Warren-Findley of the Department of History of Arizona State University is researching Governors Island's history for a National Park Service project. Information sent to webmaster@correctionhistory.org that might be helpful to her research will be forwarded to her. Or send the information directly to the e-mail address listed on her Arizona State University Dept. of History faculty page. See Page 6 for listing and links of the scores of on-line sources of Governors Island information and images used in this presentation.